At Conley Equipment Company we’ve been trusted battery suppliers for over 35 years. During this time one of the most important partnerships we’ve built has been with East Penn Manufacturing. As the largest value-added reseller for East Penn in North America, we receive a lot of benefits that we then pass on to our customers. Not only does this relationship allow us to save you money, but it also means you have a battery supplier who understands your telecommunication battery needs and is able to make the proper recommendations for your projects. We are proud of our relationship with East Penn because we know their company is deeply concerned about quality products and relentless innovation. It’s their commitment to these principles that have led them to be leaders in energy conservation and renewable resources. Their role in advanced lead-acid technology supports the start-stop feature of many high-efficiency vehicles. They bring that same level of dedication and expertise to their telecommunication battery product line. East Penn Manufacturing’s Deka Unigy I – 12AVR150-ET battery offers many benefits. Here are just some of the ones you’ll experience if you order one from Conley Equipment Company today. Fill Out the Form, Get a Free Quote! 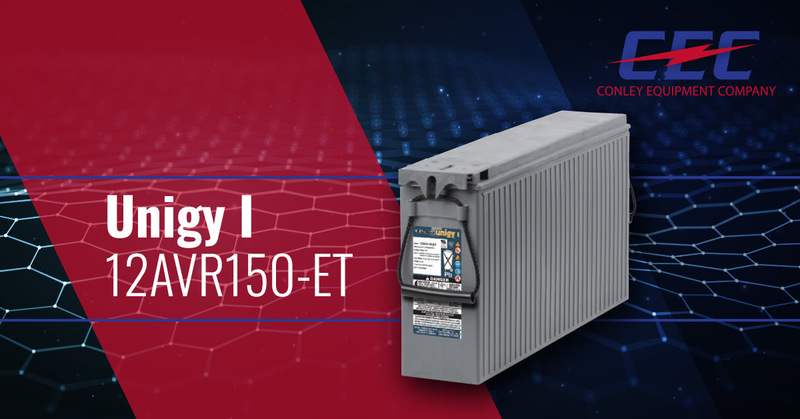 If the Deka Unigy I – 12AVR150-ET battery meets your needs, please fill out the contact form to the right in order to get your free quote. Perhaps you aren’t sure if this battery is right for you. No problem! At Conley, we have a dedicated, professional staff of consultants who can help determine your needs and offer the right products and services. We’ll never see you something you don’t need. Instead, we center our approach around the client and providing them telecommunication battery systems that give their business the boost they need. Our Product Literature section has the official Unigy I – 12AVR150-ET cut sheet. In it, East Penn covers additional features and benefits for your battery.